Day 43 of my U2 360 tour across America brought me from Maryland to Michigan for U2 360’s show at Michigan State University in East Lansing tomorrow. I left my parents’ house in Ellicott City, Maryland at 10am and arrived in East Lansing, Michigan at 7:30pm – driving 578 miles stopping only twice. It was a long, boring drive along the Pennsylvania and Ohio turnpikes, costing me a total of $22. in tolls. They are very excited here in East Lansing for the U2 360 show tomorrow. 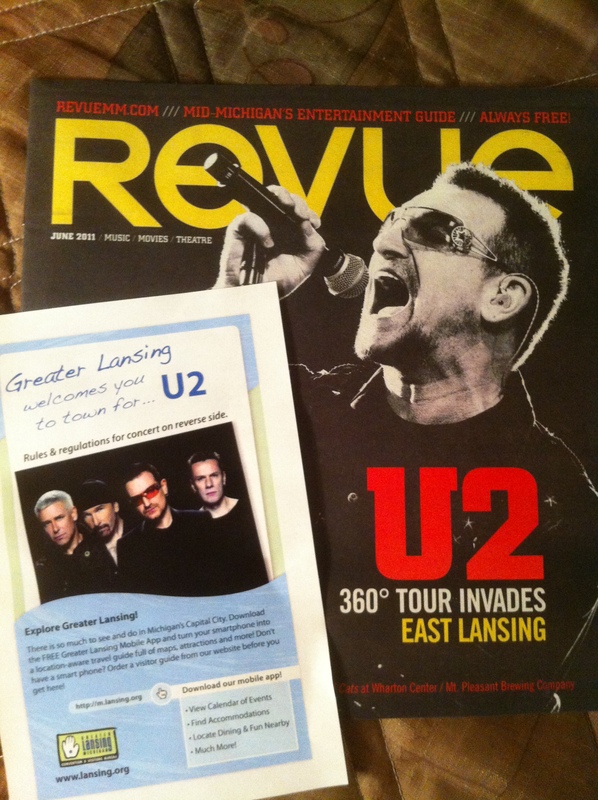 There was a U2 flyer and a newspaper with U2 on the cover at the front desk of my hotel. Apparently U2 haven’t played in East Lansing since the early 1980s and there hasn’t been a stadium concert here since the Rolling Stones in the early 1990s. Should make for quite an excited audience! I’ve never been to Michigan before, but I’m not going to do any sight seeing while I’m here. I’m just going to rest in my hotel until it’s time to walk over to the stadium tomorrow – I have a long drive to Miami the morning after the show. This U2 show in East Lansing tomorrow is the halfway point of my 360 tour – it is show number 8 out of 16.